PPP1R2 (Phospho-Ser120+Ser121) antibody detects endogenous levels of PPP1R2 only when phosphorylated at serine 120 and serine 121. The antiserum was produced against synthesized phosphopeptide derived from human PPP1R2 around the phosphorylation site of serine 120 and serine 121 (Q-E-SP-SP-GE). Small volumes of anti-PPP1R2 antibody vial(s) may occasionally become entrapped in the seal of the product vial during shipment and storage. If necessary, briefly centrifuge the vial on a tabletop centrifuge to dislodge any liquid in the container`s cap. Certain products may require to ship with dry ice and additional dry ice fee may apply. 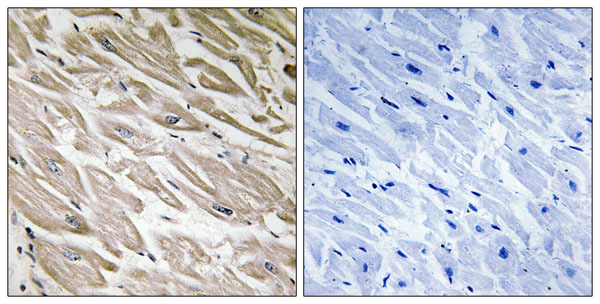 Immunohistochemistry analysis of paraffin-embedded human heart tissue using PPP1R2 (Phospho-Ser120+Ser121) antibody. PPP1R2 (Phospho-Ser120+Ser121) antibody reacts with epitope-specific phosphopeptide and corresponding non-phosphopeptide. 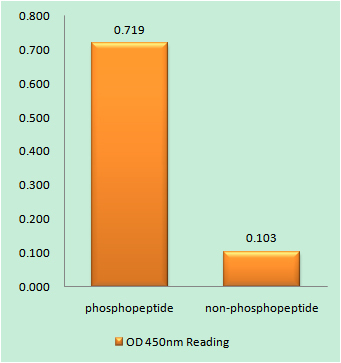 The absorbance readings at 450 nM are shown in the ELISA figure. NCBI/Uniprot data below describe general gene information for PPP1R2. It may not necessarily be applicable to this product. Sanseau P., Mamm. Genome 5:490-496(1994). Helps N.R., FEBS Lett. 340-93-98(1994). Permana P.A., Genomics 41:110-114(1997). 1. The results show that contrary to initial observations PPP1R2-related pseudogenes are not simple bystanders of the evolutionary process but may rather be at the origin of genes with novel functions.